Notes: Obviously pretty scant, but certainly nutritious. When malnutrition is so widespread, the fats from the avocado are invaluable. From Wikipedia: About 75% of an avocado's calories come from fat, most of which is monounsaturated fat. Avocados also have 60% more potassium than bananas. They are rich in B vitamins, as well as vitamin E and vitamin K. They have a high fiber content among fruits - including 75% insoluble and 25% soluble fiber. 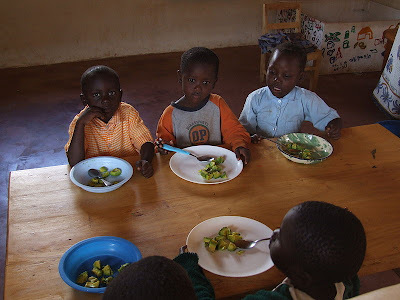 Although it doesn't look like much to us, but is more nutritious than American school lunches. It does look better than some of the lunches from poor countries you've shown us where the kids just had bowls of rice. In a poverty-stricken country, this is better than nothing. But rice and beans would be more filling, with the two combined having all the amino acids the human body needs. Yes, there's no doubt that avocados are nutritious, however, in a healthy eating, avocado should be snack or dessert, not a full meal. I love your site. You might like to feature the school meals at a slum near Nairobi where a 13-year-old girl called Molly has been making a video about how important school meals are to her. I can't people are actually saying 'for a poor country that's great!' These children are from a struggling country and eating one vegetable as an entire meal. This is when the West is gorging and poisoning their kids with unnecessary calories, fats and sugars, all the while having the means to feed them literally anything (and nutritiously). This makes me incredibly sad and frustrated. It also highlights the complete disparity in global wealth and the spoiled and ungrateful nature of all of us in the developed world. I'm gonna go eat a deep fried avocado.